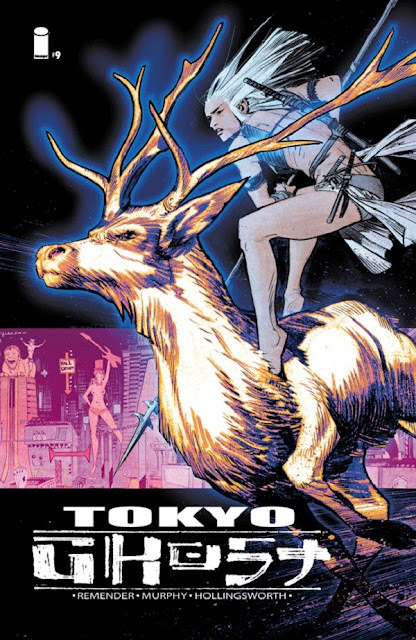 It's both exhilarating and depressing to see this penultimate issue of 'Tokyo Ghost.' The build-up over the last 8 issues has led to this and next month's finale. The roller coaster ride isn't over after the last issue's soul-crushing ending leading to the inevitable showdown between Debbie and Davey Trauma. With Flak dead Trauma is the master of his own domain. He's got Led under his control and even digitized dictator doppelgangers at his disposal to discuss his diabolical plans with, Trauma is a genocidal monster on the verge of world destruction. The only thing that can hope to stop him and achieve her revenge is Debbie. This is the crux of the issue, where Trauma lays out his plans that even the world's worst dictators find extreme only to see Debbie and her army challenge him. Remender keeps the action coming for a tour-de-force confrontation balanced with some concise exposition to open the issue. 'Tokyo Ghost' has been a smart dystopian cautionary tale where technology is the drug of choice and the themes are filled with social and political subtext. It's been an underrated sci-fi comic that really deserves more praise for its cinematic storytelling and jaw-dropping art. Sean Murphy continues to prove why he's one of the best artists in comics, establishing a body of work that could rival some legends. He creates some dynamic pages with a visionary eye for detail amid chaotic battle scenes. The transition from small tender scenes that could feel right at home in an all-ages book to larger set pieces of bloody fight sequences is flawless and electric. Matt Hollingsworth's colors infuse Murphy's work with energy and depth. Together they make the series one of the best-illustrated comics on the market. 'Tokyo Ghost' is a fantastic subversive powerhouse of science fiction that should find more readers as a trade. Those of us lucky enough to enjoy the majesty of Remender's wild script and Murphy/Hollingsworth's magnificent art on a monthly basis will have to wait anxiously for the epic final issue. The fate of the world will be decided between magical analog warriors and technologically brainwashed minions of a madman. Comics doesn't get any better than this.